Nelson Évora GCIH (born 20 April 1984) is a Portuguese track and field athlete who specializes in the triple jump. Évora is the current outdoor European triple jump champion, and a former Olympic and world champion. Évora competes at national level for Portugal and at club level for Sporting CP. He represented Cape Verde until 2002, when he got Portuguese citizenship in June that year. Born in Ivory Coast, where his parents had come to live from Cape Verde, Évora and his family moved to Portugal when he was five years old. He still holds the Cape Verdean records in both the long jump (7.57 m) and the triple jump (16.15 m). Évora's family settled in Odivelas, on the floor above João Ganço's—a former Portugal record-holder and the first Portuguese to pass over 2 meters in the high jump. Davide Ganço, one of João Ganço's three sons and one year older than Évora, became his best friend. One day, João Ganço, seeing them playing in the street, suggested that Évora started practising athletics, following Davide's example, and, just like that, Évora's sportive career started. João then became his coach. Évora is a member of the Bahá'í Faith. He competed in the triple jump in the 2004 Olympics, without progressing from his pool, and finished sixth at the 2006 IAAF World Indoor Championships. He finished fourth in the triple jump final and sixth in the long jump final at the 2006 European Athletics Championships in Gothenburg, having set a Portuguese triple jump record of 17.23 metres during the qualification. At the 2007 European Athletics Indoor Championships he came in fifth place. 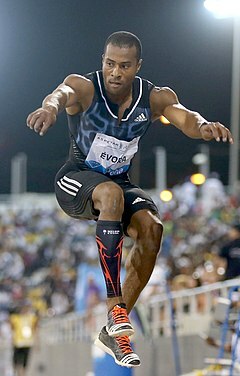 On 27 August 2007, Évora became the triple jump world champion at the 2007 World Championships, in Osaka, Japan, establishing his personal best (Portuguese national record until May 2018) and second best world mark of the year at 17.74 metres. On 9 March 2008, Évora placed third in the triple jump competition at the 2008 IAAF World Indoor Championships, in Valencia, by jumping 17.27 metres. On 21 August 2008, he edged out Phillips Idowu of Great Britain and Leevan Sands of the Bahamas to take an Olympic gold medal with a 17.67 metres jump. Évora set the world leading mark at the Grande Prêmio Brasil Caixa in May 2009, winning with 17.66 m. He was pleased with the jump (his third best performance ever) and stated his intention to surpass the 18 metre mark at the forthcoming 2009 World Championships. In mid-2009, he won the triple jump gold at the Universiade and another at the 2009 Lusophony Games. However he was unable to replicate his winning form at the 2009 World Championships in Berlin, being relegated to second place. After leading with a first round jump of 17.55 m, the man he beat in the Olympics, Phillips Idowu, was able to take the gold with a third round jump of 17.73 m, the longest in the world for that year. Évora represented F. C. Porto from 2002 to 2004 and S.L. Benfica from 2004 to 2016. ^ Pires, Bruno; Frias, Rui (4 May 2018). "Pichardo estabelece novo recorde nacional do triplo salto" [Pichardo establishes new triple jump national record]. Diário de Notícias (in Portuguese). Retrieved 5 May 2018. ^ Biscayart, Eduardo (25 May 2009). Belém spectacular produces five world season leads – IAAF World Athletics Tour. IAAF. Retrieved on 2009-05-30. ^ Fernandes, António Manuel (14 July 2009). Évora, another title in Lisbon. IAAF. Retrieved on 2009-07-23. ^ "Nelson Évora condecorado por Cavaco Silva" [Nelson Évora decorated by Cavaco Silva] (in Portuguese). S.L. Benfica. 27 May 2015. Retrieved 27 May 2015. Wikimedia Commons has media related to Nélson Évora. This page was last edited on 9 March 2019, at 12:56 (UTC).